Up to now, Paul Bettany, AKA Mr. Jennifer Connelly, has been primarily known as very talented second banana to Russell Crowe in films such as A Beautiful Mind and Master and Commander: The Far Side of the World. He returns to the medieval roots he explored in the Heath Ledger film A Knight's Tale with this exploration of corruption and morality. 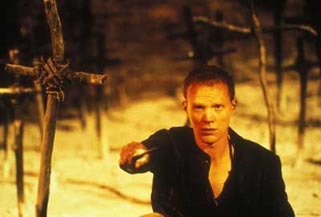 Bettany will play a 14th century priest who is trying to escape the wrath of his bishop for breaking his vows of chastity. To that end, he joins a rag-tag troupe of traveling performers as cover. Deep in the winter as society is beset by plague, the group arrives in a small town. Though the actors generally put on religious morality plays, they discover that a local mute/deaf girl has been condemned to death for the murder of a young boy. The leader of the troupe, played by Willem Dafoe, seizes the opportunity and the actors take it upon themselves to go around town and gather information about the murder, which they then intertwine into their next performance. As the play unfolds, the story begins to become larger-than-life, especially as it turns out to be much closer to the potentially dangerous truth than the actors could have ever conceived. It's clear that the accused woman is really innocent of the crime, but the powerful town leaders may have their own reasons for disguising the truth.